Get a San Diego County Traffic Ticket? You Can Beat It! Did You Get a Ticket in San Diego County, California? You can fight San Diego traffic tickets by getting them dismissed much easier than you may think. In San Diego, California, drivers are allowed to contest a traffic ticket using a Trial by Written Declaration. This is best way to fight a traffic ticket without going to an San Diego courthouse or hiring an expensive San Diego traffic ticket lawyer. We have found this to be the best way to contest a California traffic ticket, period. This option is available to every driver who receives a traffic ticket in San Diego, California. In fact, if you turn over your traffic ticket you will see that a Trial by Written Declaration is listed right on the back of your ticket as one way to fight it. This process has been around since 1978 to avoid having to pay traffic ticket fines. TicketBust has been helping California drivers prepare Trial by Written Declaration’s for over 14 years. In fact, tens of thousands of vehicle tickets in California have been contested using our system. We are the original traffic ticket fighter and the TicketBust system has been developed specifically to prepare all your documents properly based on how you answer a few questions. This way you can fight your ticket, knowing you have maximized your chances of having the court dismiss your San Diego County traffic ticket. TicketBust service will prepare your full defense package for you, which includes your Trial by Written Declaration and all the defense documents required by San Diego traffic court. Fill out the yellow form to fight your San Diego traffic ticket now! Did you know that you aren’t allowed to pass the white limit line when you are stopped at an intersection? From our experience, this can be a common ticket issued in the county of San Diego, so be on the lookout and stay behind that solid white line. If you find yourself having received a traffic ticket in San Diego, give us a call or fill out our form to see how we can help! In November of 1602, Sebastian Vizcaino surveyed San Diego harbor and what is now Mission Bay and Point Loma, naming the area for Saint Didacus, more commonly known as San Diego. 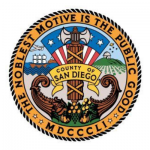 San Diego County became a part of the United States as a result of the Treaty of Guadalupe Hidalgo in 1848 and became one of the original counties of California when California gained statehood in 1850. At the time of establishment, the County of San Diego covered the entire border between California and Mexico, yet has been since divided into parts of Los Angeles, Inyo, San bernardino, Riverside, and Imperial Counties. Significant U.S. Navy presence began in the area in 1901, with the Navy Coaling Station in Point Loma followed by Camp Kearny (now Marine Corps Air Station Miramar) and the Marine Corps Base Camp Pendleton. By the early 1990s, 20% of the region’s economy was dependent on defense spending. Located in the most southwestern corner of the state, San Diego County encompasses 4,526 square miles and is home to an estimated 3.34 million people, making it the second most populous county in California after Los Angeles County and the fifth most populous county in the United States. San Diego County is the United States’ leading producer of avocados and nursery crops and is one of the top five egg-producing counties. Tourism also plays a large part in San Diego County attracting thousands of visitors to destinations like Balboa Park, Torrey Pines Golf Course, SeaWorld amusement park, and the San Diego Zoo. San Diego County also includes the University of California, San Diego, San Diego State University, and University of San Diego.